If you follow me on Facebook or Instagram, you will have seen that I recently deviated from my usual subject of British History and posted several photos of a recent trip to Rome. True history lovers can appreciate all history and no one can deny the rich contributions of the Roman Empire. Of course, it’s important to remember that Britain too was once a part that great empire. 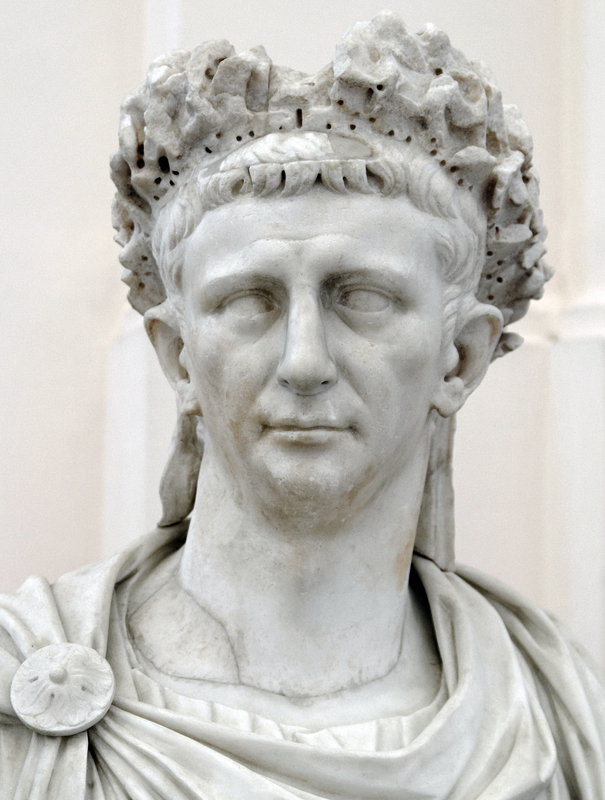 On that note, let’s take a look at the first Roman Emperor to rule over Britain, Claudius, the Accidental Emperor. During his early years Claudius’ destiny seemed so far removed from greatness that his own family tried to remove him from public life. Claudius suffered from a disability. Throughout history, disabilities were seen as a physical manifestation of a character flaw or physical proof that someone was inherently ‘bad’ or ‘stupid’. Over the centuries, historians have argued over whether Claudius had Cerebral Palsy, Polio, Tourette’s or if his disabilities were completely made up; an elaborate hoax to avoid the close scrutiny of power hungry relatives. What we do know is that he had weak legs which were known to give out under him, his head and hands shook, he foamed at the mouth, trickled out of the nose and spoke with a stammer. However, as he got older, his symptoms seemed to improve. Claudius was the uncle of Caligula, the young emperor vilified for his debauchery and cruelty. Unlike his nephew, Claudius lived a quiet life hidden away from public view where he worked as an historian. However, Caligula soon brought Claudius into the political sphere by appointing him as co-consul. Despite this, Caligula bullied his uncle mercilessly by mocking him and his disabilities, playing pranks on him and encouraging others to do the same. Caligula’s irrational nature didn’t stop with family, his behaviour towards the senate and Rome’s nobility eventually caught up with him and he was assassinated in AD41. The conspirator’s plans may have been to assassinate the entire royal family, including Claudius, and restore the empire to a republic. However, a member of the Praetorian Guard found Claudius hiding behind a curtain and declared him ‘princeps’ or boss, before whisking him away and putting him under their protection. The senate, sensing an end to their original plans, probably saw the ‘weak-minded’ Claudius as someone who could be easily manipulated and agreed to install him as Emperor. There has been some debate on whether or not Claudius was in on the conspiracy to murder Caligula and his family. Whether or not he was, he certainly benefited from their deaths. However, he knew that he was greatly underestimated and needed to prove himself. So, what does a new emperor do to prove his worth? He conquers a new land. Claudius set his sites on the previously unattainable island of Britannia. The remote region was known for it’s fertile fields, livestock and abundance of tin and gold. The Romans had wanted Britannia since Caesar launched his unsuccessful campaign in 55 BC. If Claudius was going to be taken seriously as a ruler, he needed that island. The real weakness of Britannia was that it didn’t have one single ruler. The country was split into several independent Celtic tribes. These tribes rarely got along nor did they often work together. With the help of an exiled Celtic client king (a puppet king loyal to Rome), the Romans were able to launch their invasion. Claudius appointed Aulus Plautius as general to lead the invasion. After a successful landing the Romans chased the Celts through the countryside and across two rivers with heavy battles throughout. Towards the end, Plautius called for Claudius’ assistance. This was probably a symbolic gesture as Claudius wasn’t trained for military command. Still, the emperor arrived with extra men, war elephants and heavy armaments. Leaders from eleven Celtic tribes surrendered to Claudius at Colchester, the ceremonial capitol of the Celtic people. Although this defeat was important, it would take another thirty years to conquer all of Britain (Scotland not included). Still, the underdog of Rome had done what even the great Julius Caesar couldn’t accomplish, he’d conquered Brittania for the Roman Empire. His physical ailments caused his own mother to describe him as “A monster of a man, not finished but merely begun by Dame Nature”. Yet this ‘monster of a man’ gained the respect of the people and with his conquests, he proved himself worthy of the term Emperor.